I reside with my husband, Bill in the historic Texas 1938 rock home of my mother’s teenage years, built by my grandparents, Mr. and Mrs. H. Shoemaker. My husband and I and our two children, Brandon and Brett have lived in the house since 1987. Our boys are grown, employed in other cities at this time, but they always return to the old place on Elm Creek. Not only is our Abilene home and accompanying rock garden historic, but it has also been the locale of many special family occasions through the years: my father and mother were married in the back yard, and my youngest son, Brett and his new wife, Leanna were married there this past summer! My brother, Bill was married to his wife, Janice in the front living room of our home ten years ago. The rock garden has been the delight of many children through every season, including myself and my brother and sister, as we travelled to Texas from Illinois on an annual basis to visit with grandparents and play on the grand stage of the rock garden, hunting elusive marbles cemented among the glittering rocks. As you can see from the photograph, the rock garden is like no other-quartz, crystal, desert rose, geodes, a rock boot, a large cement heart, and unusual shaped rocks such as “the brain” perched on top of a pillar. The rock garden provided us with endless hours of creative imagination. 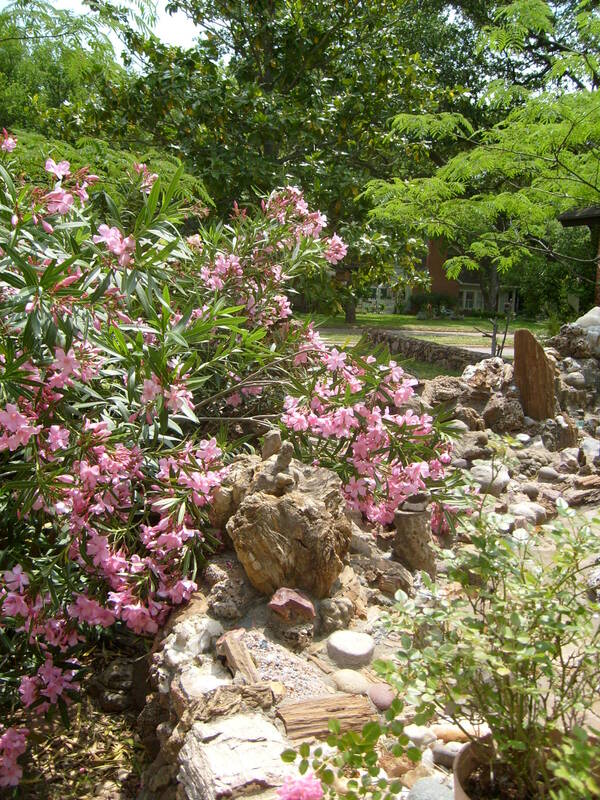 From 1987 to 2008, I have lived in this place, enjoyed the rock garden created by Dano, my grandfather, and marvelled at the intricate detail of his planning such a unique and magical place for children to play and wonder. During these same years, I have spent my entire career working with children, many of whom you will experience in exploring my blog, through the learning journey we travelled together. Hence, the name “Children of the rock garden”. All of my creative thoughts, presentations, strategies, etc. implemented with these wonderful kids in the 30 years of my career, were generated from the creative play I experienced on and around the rock garden as a child. Kids are kids, regardless of their varied needs, and each one is as unique and beautiful as the rocks in the garden. The rock garden continues to grow in depth and beauty as my family returns from every trip with another bright addition to the garden. I hope you enjoy my blog as it is developed. I plan to include items of interest related to my favorite activities, and add a little knowledge about educating children. The purpose of the education stories included in my blog is to offer ideas and strategies to adults with missions of providing children with the tools they need to develop active problemsolving and creative learning. Today’s children must be able to communicate effectively with others and strategically plan and implement real experiences to successfully function within the social context of our world. This is my first attempt at blogging! I am hoping this will provide me with the medium I’ve needed for writing and sharing thoughts from my career and my life!